Well, it looks like Iceland is going to be in the news again this summer. Jon Frimann and others noted a sharp increase in seismicity under the Vatnajökull icecap at Grímsvötn today and MBL.is has confirmed that if an eruption hasn't already begun under the icecap, then one is likely to be starting soon (in Icelandic, use Google Translate at your risk) according to geologist Louw Sveinbjörnsson. UPDATE: There is confirmation of an ash and steam plume possibly reaching 1.8 km / ~6,000 feet above the volcano (see images below), but again, the details are scant. 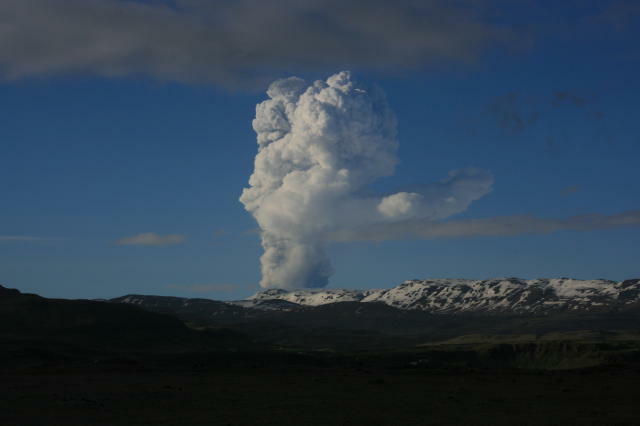 The eruption itself appears to be from the Grímsfjall Crater. There is very little news that I can find in English for this event - but hopefully Jon and any one else in Iceland can keep us appraised with what is going on in Iceland. The danger now will be from jokulklaups within the next 10-12 hours draining to the south or ash disrupting air travel in and around Iceland. Earlier this year, there were some predictions of an eruption under Vatnajökull made by Icelandic geologists that were quickly retracted as well. Grímsvötn last erupted in 2004 (see top left), with some impressive plumes produced by the eruption melting through the Vatnajökull icecap under which the volcano sits. You can check out my post on Vatnajökull (and the 7 volcanoes under the icecap) to find out about volcanism in that region of Iceland - and see the details of the jokulhlaup that occurred at Grímsvötn last fall that was not believed to be related to a subglacial eruption of the volcano.